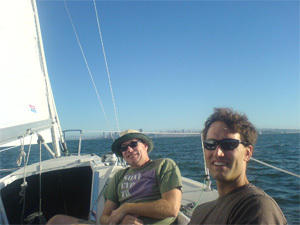 The wind picked us up right away in the Marina, and carried us merrily past the old rusty Victory ship, out into the Bay -- where it went slack. 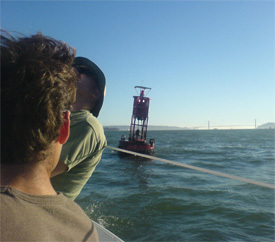 We had to resort to the iron sail to carry us past the wind block of Angel Island, but once beyond it, the winds in the center of the Bay took over with vengeance. 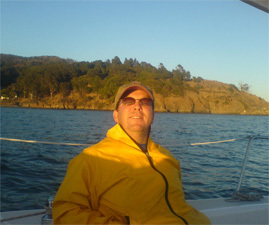 We had a real sleigh ride out almost to Alcatraz, then tacked and raced along the southern shore of Angel Island in the fading afternoon sun. Then, nothing but stillness. 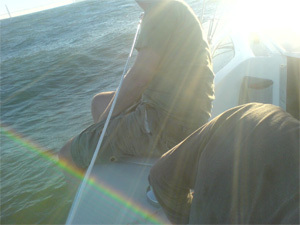 We bobbed off Belvedere for a half hour or more, unable to break the spell of the sea and the setting sun. Finally, common sense prevailed and we motored up. We ran the last 20 minutes in the dark, with no running lights, watching out for the Harbor Patrol. But it was worth it to enjoy every last minute of that afternoon.